One of the things you should know before you land in Ireland is that while you’re there you really should avoid asking someone for a ride when what you mean is that you’re hoping they’ll give you a lift in their car because in Ireland ‘riding’ can mean something of a much, much more personal nature. If you’re speaking with a North American accent folks will know what you really mean but might have a bit of chuckle anyway, if you use the former terminology. In Ireland the sidewalk is known as the ‘path’, hair bangs are your ‘fringe’, the parking lot is a ‘car park’ and a cell phone is a ‘mobile.’ Something else you soon notice is that Irish people have a habit of putting the word ‘sure’ at the beginning of an inordinate amount of sentences eg. “Sure, didn't he make a right fool of himself last night.” The word ‘now’ is also a popular way to begin a sentence and uncertainty that North Americans often express as ‘um’ at the start of a sentence in Ireland comes out as more of an ‘ahm’ sound. Having lived in Ireland for years and been married to a Dub (translation: someone from Dublin) for even longer my brain switches into an Irish version of English as soon as I land on Irish soil. It’s a weird thing because, of course, North Americans and the Irish speak the same language but just as people drive on the opposite side of the road in Ireland, they use the language differently. More artfully and expressively, in my opinion. Anyway, once I’m in Ireland (provided I’m speaking with an Irish person) I automatically substitute ‘car park’ for ‘parking lot’ and ‘mobile’ for ‘cell phone’ (although I never quite manage ‘path’ instead of ‘sidewalk’). I’ve even been know to fall into an Irish way of arranging a sentence, asking “Are they not?” rather than “Aren’t they?” and having been back in Canada for years now, still regularly use the phrase “giving out” which basically means scolding/complaining. However, enjoying a cup of tea is something I’ve yet to master. In Ireland the corner shops carry Polo mints (which, sadly, are not to be found on this side of the pond except in import stores), ‘packets of crisps’ instead of’ bags of chips’ and chocolates bars like Wispa, Lion, Double Decker, Peppermint Cream (all sadly as absent here as Polo mints). In Ireland salt clumps in its shakers because of the damp. In Ireland twenty degrees Celsius can be considered a scorcher of a summer’s day. In Ireland, even summer grass is green. In Ireland, in the middle of summer, it isn’t dark until ten o’clock at night and it’s light again just after five in the morning. In Ireland your bus driver might look like Cillian Murphy (No, really! But more on that later). In Ireland national TV channel RTÉ One broadcasts the ringing of the Angelus bells (traditionally, a call to prayer by Roman Catholic churches) every day before the six o’clock news. In Ireland people text on their phones even more than we do here. And in case you haven’t already guessed, or read it on my blog before, I’m still in love with Ireland, despite the salt clumping and the scorching days of twenty degrees. I will probably always be in love with Ireland, or more specifically, Dublin. When I’m in Dublin I never tire of strolling the city streets (almost obsessively to be honest) absorbing the atmosphere and the architecture. While in Dublin there are certain places I can’t stay away from and begin to feel a pull towards if I haven’t visited in a couple of days. Some of these spots are bookstores – Eason’s on O’Connell Street and Hodges Figgis and Waterstones on Dawson Street – but most of them are Dublin landmarks: The Ha’penny Bridge, Trinity College, Temple Bar (which is an area of Dublin rather than an actual pub, although there are plenty of pubs there! ), Grafton Street (amazing buskers + pedestrian shopping) and if it happens to be sunny, St. Stephen’s Green park. I’ve been visiting Dublin for twenty years now (and lived there for five) and can never get enough of these places. Because Dublin and I go way back, my appreciation for the city is now experienced through layers of nostalgia. I see the changes and I see what’s remained the same. The Luas (Dublin’s rapid transit tram system) didn’t exist when I lived in Dublin. Neither did the Spire smack in the middle of O’Connell Street. The Dundrum Town Centre shopping mall (the country’s largest) hadn’t been built yet. Divorce was not legal. Now the Irish divorce rate is 27.5%. There’s a subway system planned from downtown Dublin, with a line out to the airport and extending as far out as suburban Swords in the north. When I first lived in Ireland the national unemployment rate was almost 16%. In 2001, the roaring Celtic tiger economy dragged the number as low as 3.7%. Today Irish unemployment is back up to a staggering 13.7%, a figure not seen since 1994. But the population of Ireland is both a very well-educated and resilient one and I know they’ll come back from this. Things change…and then change again. And yet, just a week and a half ago when I got on a Dublin bus with my weekly pass inevitably the same thing that always used to happen happened again: my bus pass conked out on me long before the week was out, rejected by the automatic reader at the front of the bus which necessitated that I show it the driver to prove I wasn’t trying to board for free. This leads me to another fact of Irish life that has remained more or less the same over the years that I’ve been acquainted with it: more startlingly gorgeous blue eyes in a population than seems fair – on everyone from eighty-year old pensioners to toddlers to gangly teenage boys. And speaking of blue eyes, this is where I approach the part of the post about my not so VIP life. I’m a big Cillian Murphy fan (love him in everything from On the Edge to Perrier’s Bounty) and have attended premiere’s of several of his movies at the Toronto Film Festival but in Dublin a few weeks ago I was in the same VIP area with him at a comedy festival in The Iveagh Gardens and didn’t even know it until days later when a friend informed me that he’d been there all night and that if I’d just turned my head and had a look around…Since I’m virtually never in a VIP area, let alone a VIP area in Dublin, this seems almost tragic. Not that I would have said anything to him but, you know, it would’ve been cool just to see him there. Clearly, the moral of that story is keep your eyes open, because you never know what you might be missing! 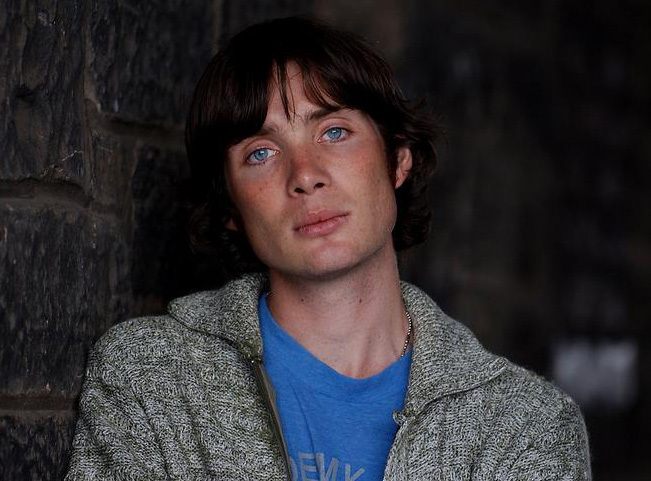 However, it seems the universe sympathized with my inattention a little because just over a week ago Paddy and I caught the 16A bus into town and the driver was, I swear to you, a doppelganger for Cillian Murphy in 28 Days Later after he’d shaved his head. That afternoon the 16A was probably the most packed bus I’ve ever been on in my life, filled not just with people (there wasn’t a seat to be had and so many folks crammed together standing that the bus had to skip stops – not an inch more room for anyone else!) but having just come from the airport, also tons of stacked suitcases. Periodically people rung the bell and struggled to disembark with unwieldy luggage. One lone woman was finding leaving the bus with her baggage an especially onerous task and the Cillian Murphy lookalike got up from his driver’s seat and carried her suitcase outside for her. Nice. I ask you, where else are you going to find a guy who looks like Cillian Murphy driving a city bus and helping you with your luggage? And the moral of my story about the 16A is 1) again, keep your eyes open 2) taking the bus can have its advantages (although, I can’t say for sure that said bus driver would be as effective in a zombie outbreak as Cillian’s character Jim in 28 Days Later). On the subject of Dublin transportation, I could also tell you about the time not long ago that I hopped on the DART (the Dublin commuter train that winds around the coast) on my way to see a friend on a bank holiday Monday and there was an announcement that the train would be skipping my stop and the one before it (which virtually never happens, the train normally stops everywhere) because of maintenance work. Ooops. This meant I would either have to end up at the end of the line in Bray or call my friend to pick me up in Dalkey. Luckily, in the end my friend’s husband drove out to Dalkey to collect me. Saved! Not that I have anything against Bray or Dalkey (to my knowledge there are no zombies in either place) but still, neither of them were my destination. And I suppose the moral of that story is to expect the unexpected and have your cell phone (or mobile, if that’s what you prefer to call it) handy and charged. Soon united with my friend, we spent the evening watching the LOST finale together and tearing up all over again. Goodbye, Charlie (you’re still my favourite). Goodbye, Kate. Goodbye, Jack. Goodbye, Ben (I don’t hate you anymore). Goodbye, steady Hurley. Goodbye smart-mouthed Sawyer. 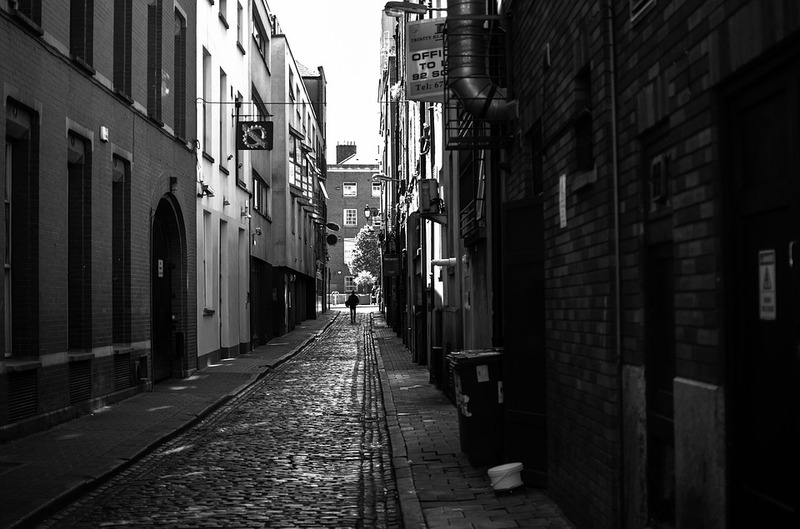 And goodbye, Dublin…for now. I’ll see you again soon, okay? Sure, another visit is just around the corner. I’ll wander through the streets with a package of Polo mints in my pocket, stop at Bewley’s on Grafton Street for a lemon cupcake, take in a movie in the Savoy and a play at the Gate (if you have a chance, pick up tickets for Death of a Salesman there in the next few days, Harris Yulin is outstanding as Willy Loman) or the Abbey Theatre. 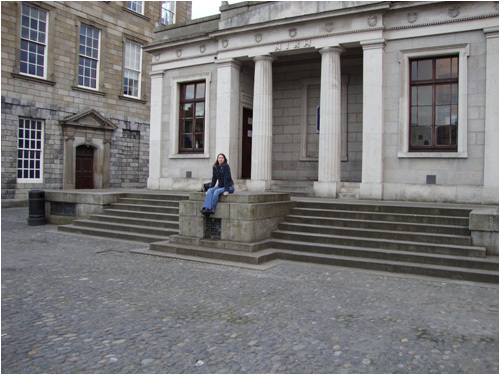 I’ll sit in the grounds of Trinity College like I did the first time I was in Dublin and like I have during every visit since. I’ll lie on the grass in Stephen’s Green (but only if it’s sunny and a scorcher of a summer’s day!). And I’ll watch you change and watch you remain the same, like how the 46A still makes the run to Dun Laoghaire just as Irish band Bagatelle sang about in Summer in Dublin back in 1980. And I’ll just keep coming back, because you and I, we’re never done.